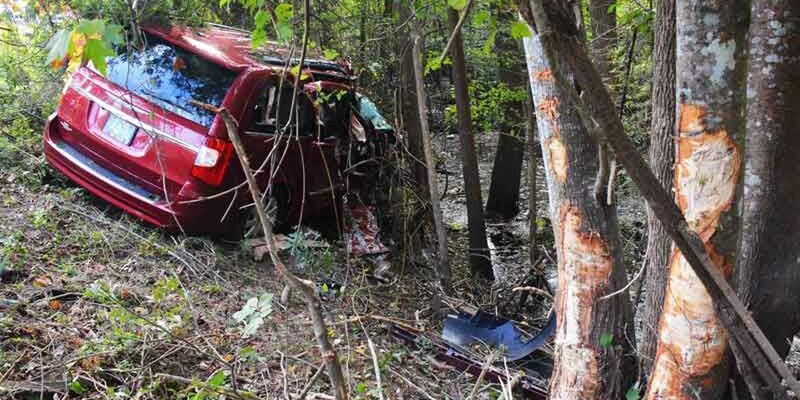 COLLETON COUNTY, SC (WCSC) - An 81-year-old woman died after a van left the roadway and struck several trees in a swamp in Colleton County on Wednesday afternoon. Colleton County Fire and Rescue Department officials say the accident happened on I-95 near mile marker 40. When emergency crews arrived they reported the driver, an 83-year-old man and husband of the deceased, suffered minor injuries and denied transportation to the hospital. CCFR officials say the van left the interstate, drove down an embankment and struck several trees in a swamp. According to authorities, the woman who died was wearing a seatbelt, suffered multiple traumatic injuries and was trapped in the wreckage. Officials say crews from both Hampton and Colleton used special tools to remove the passenger door. CCFR officials stated that they brought the deceased's husband and the family dog to a motel to await family members.